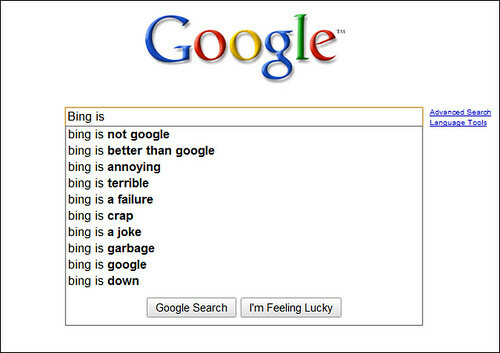 So, we have “Google is Skynet”, “Yahoo is better than Google” and “Bing is not Google”. It’s amusing and insightful at the same time. As the clear market dominator, Google queries offer a peek into searchers’ perception of Google as a powerful force that can incite polarizing opinions. Yahoo as a long standing second in the market brings about more functional phrases and just one indication of passion for the brand. While Bing shows some negativity, the good news is that they are inciting reactions from people. Better to make friends and enemies than for no one to notice you at all. By the way, Google recently announced the addition of localized search suggest and spelling correction to the suggest features that searchers might find handy. Love “better than Google” search. The goal of our lives to be better that someone else, isn't it? hahahaha loved the article. but seriously. 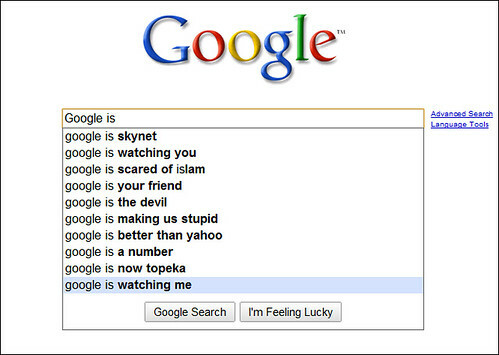 google is skynet. Hi Lee,I have also seen a lot of peculiar search results while searching especially when you type “how to” and similar searches as above,This seems like Google is too good at getting organic results as far as the searcher's perspective is concerned. The Search Suggest options presented should be a reflection of what people are searching on. Just looking at numerous web site analytics can show how many peculiar things people search for. Keyword research is one of the basic tasks of search engine optimization. Tools have made it really easy and present with some really necessary suggestions. Hey Lee… have you checked out the new Google Suggest super-scraper from Promediacorp? It can actually give you a lot more of the funny Google Suggest terms for any search query. How about… “Google is a pervert”? I think this is a great way to get some quick and general information on which long tail phrases to go after. Starting with just a couple of general keywords you are able to see the types of long tail phrases that people are searching for and you can also then search those phrases to check out the competition for them. the suggestion from search engines will always help the searcher and thats makes it an important tools for business to great idea on what searchers are looking for. Stumbled across this lovely feature the other day… Google shows you results in an ever connected web as your explore them. Very handy and revealing. 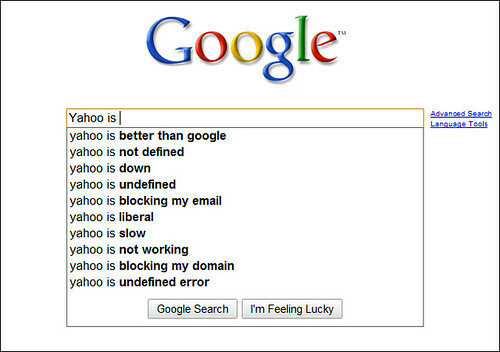 Google still has more features and and is way ahead of yahoo. My favorite is the spell checker tool! That’s funny. My husband says the same thing. Skynet must be destoryed. Those evil f*ckers. Its indeed a great innovation in searches.